Cal Newport's clearly-written manifesto flies in the face of conventional wisdom by suggesting that it should be a person's talent and skill - and not necessarily their passion - that determines their career path. Newport, who graduated from Dartmouth College (Phi Beta Kappa) and earned a PhD. from MIT, contends that trying to find what drives us, instead of focusing on areas in which we naturally excel, is ultimately harmful and frustrating to job seekers. The title is a direct quote from comedian Steve Martin who, when once asked why he was successful in his career, immediately replied: "Be so good they can't ignore you" and that's the main basis for Newport's book. Skill and ability trump passion. Inspired by former Apple CEO Steve Jobs' famous Stanford University commencement speech in which Jobs urges idealistic grads to chase their dreams, Newport takes issue with that advice, claiming that not only is thsi advice Pollyannish, but that Jobs himself never followed his own advice. From there, Newport presents compelling scientific and contemporary case study evidence that the key to one's career success is to find out what you do well, where you have built up your 'career capital,' and then to put all of your efforts into that direction. Overall, this was a good book with some provocative original ideas - but with some deep flaws. "The traits that define great work are rare and valuable. Supply and demand says that if you want [this work] you need rare and valuable skills to offer in return. Think of these rare and valuable skills you can offer as your career capital. The craftsman mindset, with its relentless focus on becoming “so good they can’t ignore you,” is a strategy well suited for acquiring career capital. " Newport suggests a strategy of acquiring career capital - and then investing it in better roles. * start "deliberative practice" - "Deliberate practice is the key strategy for acquiring career capital then integrating it into your own working life." As per the 10,000 hours philosophy espoused by Anders Ericsson and then Malcolm Gladwell..
"Control that’s acquired without career capital is not sustainable." "The point at which you have acquired enough career capital to get meaningful control over your working life is exactly the point when you’ve become valuable enough to your current employer that they will try to prevent you from making the change." Then, develop your mission by getting to the cutting edge of your field and spotting what is possible in the adjacent future. In spite of the good in the book, I think Newport made several major mistakes that radically reduced the forcefulness of his book's argument. I just want to tackle one of them here, which is his attack on the "passion hypothesis." "The key to occupational happiness is to first figure out what you’re passionate about and then find a job that matches this passion." Then Newport proceeds to tell us why this hypothesis is wrong. Unfortunately, this "passion hypothesis" is a straw man, an artificial construction created by Newport. According to Newport, the poster child for the passion hypothesis is Richard Bolles and his book "What Color is Your Parachute." Newport however seems to have completely missed the point of Bolles' book - and the central point of similar books in this genre. "Passion" was not what was at the core of Bolles' book. In fact, the word "passion" was rarely mentioned in the book. Instead, Bolles advocated an alignment between Skills, "Knowledges," and (in different editions) either Values or Purpose, together with conceptualising an ideal work environment. ** Bolles' book placed skills at the very centre of his approach **. For Bolles, 'skills' were NOT ignored. They were the very foundation. To say Bolles' approach was just about "following your passion" - and doing so at the expense of skills - is either a deliberate mischaracterisation of Bolles' work, or shows an astonishingly low level of understanding of the point of view that Newport is attacking. And it's not just Bolles who took this skills-based approach to career and business development. Most of the common models in the 'find your career' or 'do work you love' or 'start your business' genres tend to follow something like the Jim Collins Hedgehog model - combine what you love (your interests or passions) with what you're good at (your skills and strengths) and a market need. This isn't just a minor point. This is a gaping hole in the fundamental premise in the book - that other people tell you to just go and follow your passion, that that's wrong, and Newport alone has a different and better way. Well, Newport's way - to focus on skills development - is along the lines what everyone else does anyway. Newport makes some good contributions about the process of developing your skills and using them to advance your career. But his rhetorical positioning that everyone else is just about following your passion and only he can show us the 'true path' is plain wrong. I do recommend reading this book as it has some good ideas and for me it generated some good reflections. Just be aware that there is a gaping hole in his premise around the role that passion plays in career development. And that he uses the same rhetorical device of constructing and attacking a false 'straw man' in his next book, Deep Work - so this seems to be a deliberate strategy or preference on Newport's part. I had mixed feelings towards this book. It has a brilliant and very good premise, where following your passion is bad advice. Instead, you need to sweat to get to work you love, and that's captured brilliantly by the author in what he calls "career capital". He refers to a vast array of experiences and research to support his argument. But, the author is so obsessed by strong words like "laws" and "rules", and has a rather dry writing style. I also caught him several times trying to forcefully project general experiences in his frame of thoughts and rules. Actually, the first two can be called rules. The last two are more of a couple of traits (control/autonomy, and mission/meaning) that someone who has built his career capital with hard work can enjoy and target. There could be a fifth and a sixth, etc. Which means the hardly can be called rules. On another note, his theory and findings are very simple, but he keeps repeating again and again the same words and sentences. For instance, when he reaches Rule #3, he would go and lay out his arguments for Rule #1 and Rule #2. In Rule #4, he will go and lay out the same monotonous arguments for Rule #1, #2, and #3. And the same happens at almost the beginning and ending of chapters and parts, and at the conclusion. I find it very annoying! On another note, he keeps elaborating on the experience of his subjects in extended lengths of narrative. Not a single time, I wanted to say: "cut it short, Cal!" Again, the premise of the book and his findings are great and I consider them crucial for anyone who takes his career seriously. I, however, see the readers will go through unnecessary labor to reach simple conclusions that hardly need more than 50 pages of writing. I've been following Cal Newport's ideas for a while now, so when I learned that he was coming out with a book, I pre-ordered it from Amazon. I was not disappointed. If you have a child or know someone in college who is trying to figure out what to do with their life, or even if you're north of fifty and still wonder what you'll be when you grow up, then this book is for you. So Good They Can't Ignore You, is so good that you shouldn't ignore it. The central premise that sets this book apart from so much life advice that is out on the market is that following your passion is terrible advice. There are two main reasons for this: first, very few people at a young age know enough about life to choose something to be really passionate about, and even if they do, they are bound to be wrong. If Steve Jobs had followed his early passion, maybe he would have made a dent in the universe as a Buddhist monk. Second, while most people would love to have a job that allows them to be creative, make an impact on the world, and have control over how they choose to spend their time, jobs like that are rare and valuable, and the only way to get something valuable is to offer something in return. And the only way to be in a position to do that is to master a difficult skill. Passion doesn't waive the laws of economics, and if it's not difficult it won't be rare. The book cites the example of Julia, who quit a secure job in advertising to pursue her passion of teaching yoga. Armed with a 4-week course, she quit her job, began teaching, and one year later was on food stamps. Here's a hint: if a four-week course is enough to allow you to set up shop, do you think you might have a little competition? Taking the economic model a step further, the book argues that you must develop career capital, which comprises skills, relationships and a body of work. The long and arduous process of building your capital also opens up your options and refines your own understanding of what you really like to do and what you can be good at. What's the little idea? Another idea that Newport challenges is the common advice that you should have a big idea--set a big hairy audacious goal for your life and then work backward from it. The master plan approach certainly works for some people, but how many people do you know who have actually lived their lives that way? Instead, you should work forward from where you are, taking small steps that expand your capabilities and build up your career capital. In this way, more options and possibilities open up. Newport compares career discoveries to scientific discoveries, most of which occur in what's called the "adjacent possible", or just on the other side of the cutting edge of current knowledge. The book is well-written. Newport emulates Malcolm Gladwell's technique of telling individual stories to illustrate the main point in each chapter. In addition, the arc of the stories follows a master story thread through the book, so that you feel like you are brought along on his quest to figure it all out. Here comes the part I did not like about the book, and I would not devote so much space to it if the author were not an MIT PhD, just beginning his career as an assistant professor of computer science. The methodology in the book is suspect in two ways. While its stories are the book's great strength, the plural of anecdote is not data, and it's surprising how little hard data we're given. I certainly buy in because it makes sense and it matches my own life experience, but someone with a more skeptical point of view may be a tougher sell. In at least one case, where he does use a peer-reviewed study for support, he overstates the case. 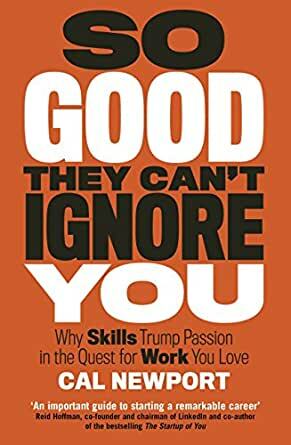 Citing a paper by Amy Wrzesniewski, he states that the happiest, most passionate employees are not those who followed their passion into a position, but those who stayed around long enough to be good at what they do. If you read the actual paper, you won't find that conclusion, and in fact the author stresses that the sample size of 24 is too small to draw any firm conclusions. That said, I strongly recommend this book to just about anyone, regardless of where you are in your career.